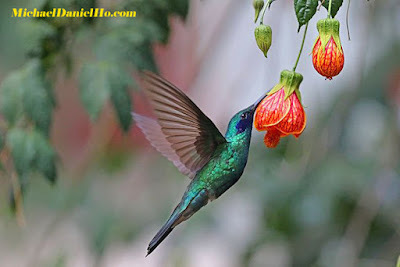 Hummingbirds belong to the family of birds known as Trochilidae. They are among the smallest avians, most species measure about 3 to 5 inches in length and generally weigh between one to two tenth of an ounce. 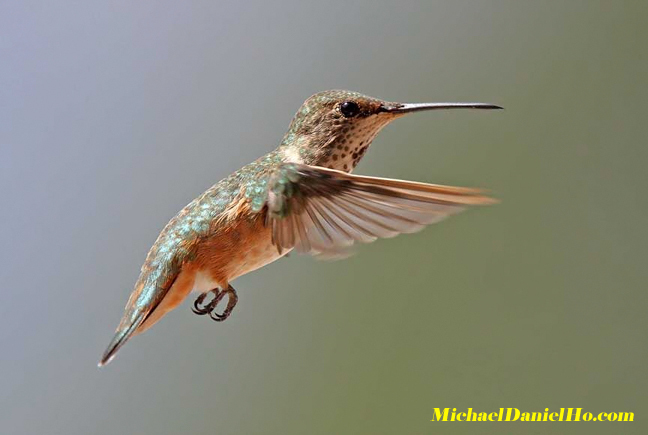 The smallest Hummer is the Bee Hummingbird and the largest is the South American Giant Hummingbird, which can weigh about an ounce. All Hummers can hover in mid-air by rapidly flapping their wings approximately 10 to 80 times per second, depending on the species, and they can fly between 20 to 30 mph, reaching over 60 mph in a dive. Hummingbirds have one of the fastest heart beats in the animal kingdom, with one species (Blue-throated) clocked at well over 1,000 beats per minute. They are also the only group of birds able to fly backwards. No one really knows how long Hummingbirds live in the wild but most experts agree the average life span is between 3 to 4 years. However, in captivity they can live well over 10 years. 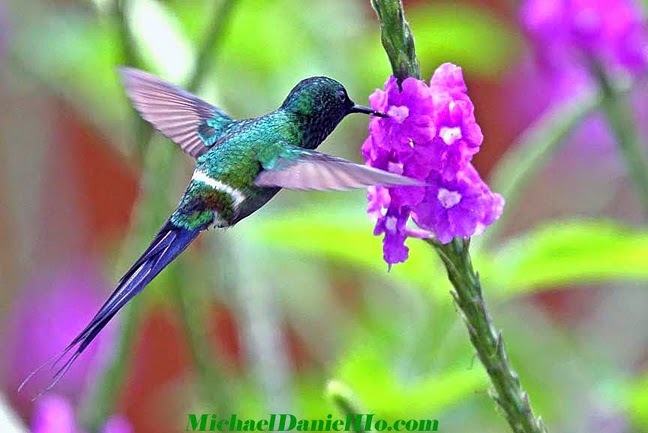 There are over 300 different species of Hummingbirds. They are found only in The Americas, from southern Alaska to Tierra del Fuego, including the Caribbean. Their habitat range from the lowlands all the way up to the snow line at 16,000 feet in Ecuador. The area containing the most species is the subtropical zone of Central America, down to Columbia and Ecuador. 133 species can be found in Columbia alone and the United States has about 18 species. Like most birds, Hummers have virtually no sense of smell, they are attracted to their food source mostly by sight. Shrubs, vines and flowers like Coral Honeysuckle, Fuchsia, Texas Sage and Columbine are good sources of food for these voracious feeders. 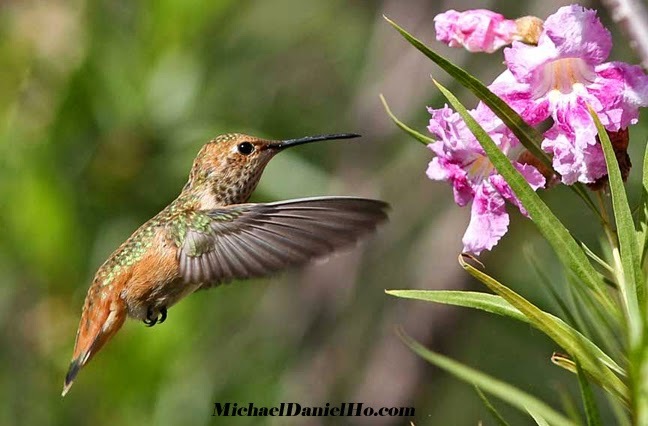 In addition to their intake of nectar, Hummers also feed on small insects to supplement their diet with protein. 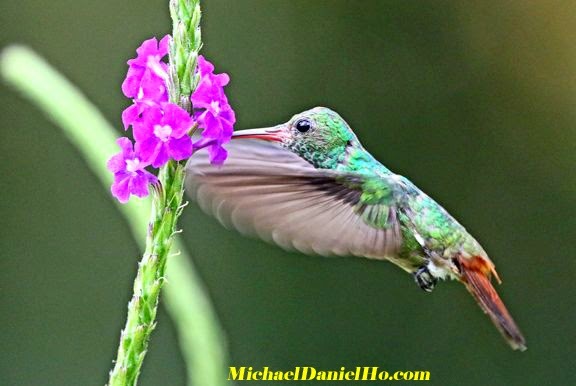 Hummingbirds are known for their rainbow colors and the brilliant, iridescent plumage of the males make photographing them especially enjoyable and challenging. Many hotels, resorts and restaurants in Central America put out feeders to attract these birds and one can photograph them with little difficulty. Generally, I do not like to photograph Hummers on a feeder, except during migration season, when feeders are put out to give them extra food and replenishment. Staging elaborate props and multiple flashes to photograph Hummers never appeal to me. I like the challenge of finding and photographing them naturally. Locating Hummers in the wild can be quite a challenge. They can easily camouflage themselves in trees and foliage. I follow my two 'Hummer rules' - Listen and Freeze. Most Hummers make sharp, chirping sounds. Train your ears to focus on these sounds and you can locate the general area. Then remain perfectly still. When you are motionless, small movements of the Hummingbird bobbing in and out of flowers and foliage will reveal its exact position. I am rather punctilious when it comes to Hummer photography. Only certain shots appeal to me, like freezing their wings in a fully swept back or forward position. The Canon EOS-1D X Mark II , EOS-1D Mk IV and EOS-7D Mk II cameras plus the EF 70-200mm f/2.8 L IS II, EF 400mm f/4 DO IS II and EF 200-400mm f/4L IS lenses are the equipment for my work. Read my FAQs on camera and lens recommendation and see my equipment bag here. I photograph in the Aperture (AV) mode and set my camera to 1 stop above the maximum and an ISO speed of between 400 to 800, if the light is good. Generally, a shutter speed of at least 1/1250 second is required to obtain sharp, stop action shots. The Drive Mode is set to maximum continuous burst, the faster the better. If the light is poor or fading, I will open the lens up to its maximum aperture and go all the way up to ISO 3200, in that order, if necessary. My AF points are set to the center if the bird is feeding in thick foliage and surrounding assist points turned on as well when the foliage is sparse. Focusing Priority takes precedent over shutter release or frame rates. No point in getting blurry shots unless the subject is clearly in focus. Depending on where the majority of light is coming from, in relation to the bird, I would also adjust my Exposure Compensation to account for the reflection from the bright colorful gorgets. With the combination of bodies and lenses I bring, it affords me a good range of focal lengths, ranging from approximately 70mm to 900mm. Occasionally, I will use the 1.4X extender and extension tubes. Usually I do not use a tripod because most Hummers in the wild tend not to stay in one place too long. When I do use one, the light weight, carbon fiber Slik Pro 634 CF and 824 CF work well for me. 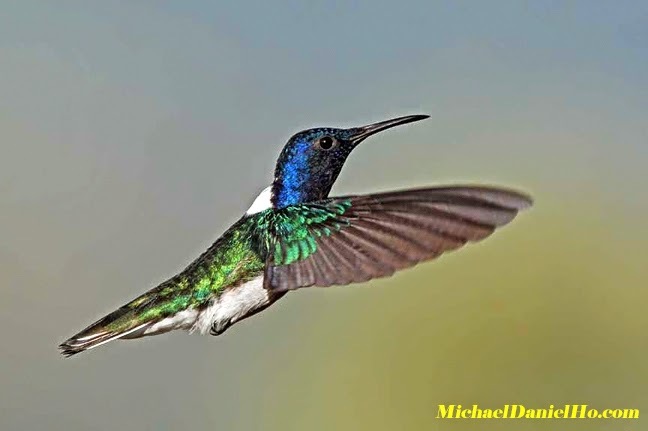 Freezing a Hummingbird in midair with its wings completely stretched out, in all its resplendent colors, is one of the most exhilarating photographic experiences. There are many birding tours offering to take photographers on a journey of their life time. Stick to one or two areas and do plenty of research before you go. National parks and official tourism sites of the countries you plan to visit offer many valuable information and tips for free. 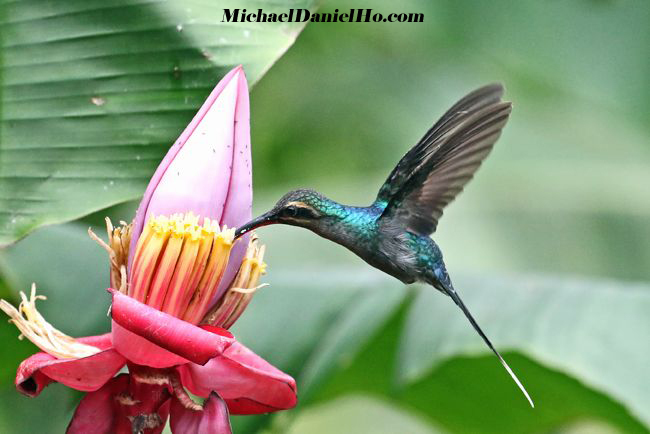 Photographing Hummingbirds require a lot of patience, practice and luck. Click here to view some Hummingbirds photographs I have taken over the years. For more posts on photographing other wildlife, you will find African elephants, Polar bears, Bengal tigers, Killer whales and Blue whales adventures here. I have been The Wildlife Ho-tographer for 25 years using Canon gear. You can read my FAQs on equipment and see more of my work on MichaelDanielHo.com. You can also follow my travels on my Blog, Twitter , Instagram and Facebook. 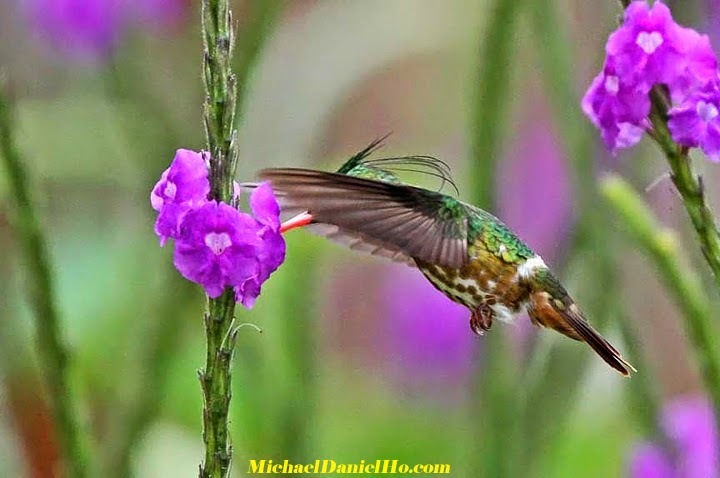 Incredible Hummingbird photos. Thanks for the tips and advice. Great post. Your photos are simply amazing. Great article on how and where to photograph Hummers. I will put your suggestions to good use in my back yard. Thanks for your kind words. Hummingbird photography can be very rewarding but one must be prepared to wait the birds out. Many shots are not up to my standard because of the 'wrong' angle. A 15-20% retention rate is a already good day. 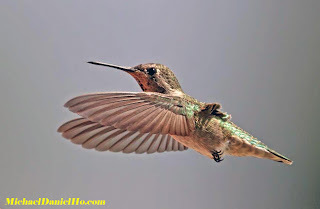 Thanks for this article on how and where to photograph Hummers. Love your wildlife photography.